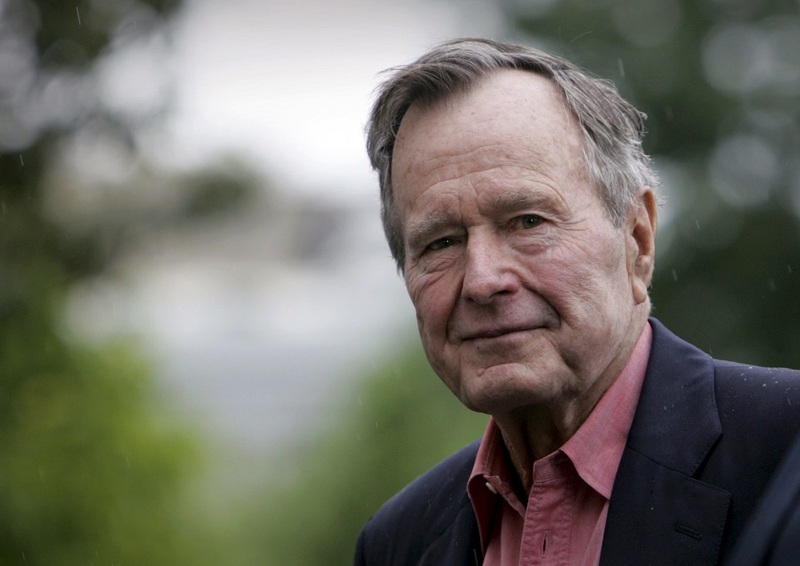 HOUSTON (CN) – George Herbert Walker Bush, the patriarch of a political dynasty, died in Houston on Friday. He was 94. He is survived by his children George W., Jeb, Neil, Marvin and Dorothy. His wife Barbara died earlier this year. As a Navy pilot during World War II, the elder Bush flew 58 combat missions and had a brush with death in September 1944, when Japanese forces shot down his plane. He parachuted out and floated for hours in a raft in the Pacific Ocean before a U.S. submarine crew rescued him. One member of Bush’s crew died in the wreck when his parachute failed to deploy. 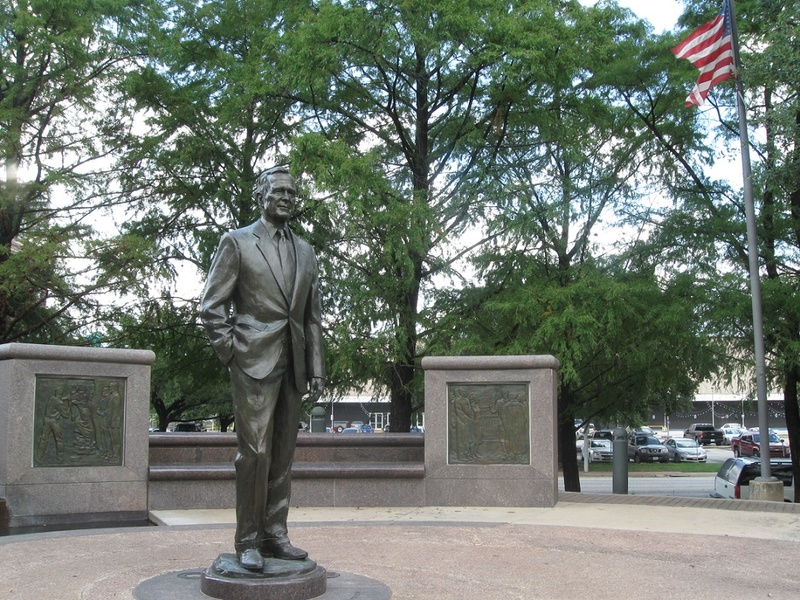 A statue of George H.W. Bush, the nation’s 41st president, in downtown Houston. (Photo by Cameron Langford/CNS). More than he could have imagined. After serving in the war, Bush married Barbara Pierce and attended Yale University, graduating in two and a half years with a degree in economics and playing first base as captain for the Bulldogs’ baseball team in the first two College World Series. Upon graduating from Yale in 1948, Bush went to West Texas where he used his father’s connections to find success in the oil industry. He started as an oil drilling equipment salesman. In 1951 he founded his own oil development company, which made him a millionaire. Bush got his start in politics after moving his family—wife Barbara and their five kids—from West Texas to Houston in 1959. Local Republicans elected him chairman of the Harris County Republican Party in 1963. Houston is Harris County’s seat. Not known for his public speaking skills, Bush nonetheless quickly ascended the political ladder, winning a seat in the U.S. House of Representatives in 1966, and serving three terms before leaving the office for an unsuccessful U.S. Senate run in 1970. Despite the Senate campaign defeat, Bush’s political career went international. He served as U.S. Ambassador to the United Nations, then as the U.S. envoy to China from 1971 to 1975 and followed up with a two-year term as Central Intelligence Agency director. After a brief hiatus from politics, Bush re-emerged more ambitious than ever. He ran for president in 1980, but lost in the Republican primary to Ronald Reagan, who selected Bush as his vice president on his way to winning the presidency. Bush’s ascension to the presidency seemed inevitable after eight years as vice president. That vow came back to haunt Bush, who unlike today’s Republican leaders thought it wise to reduce the federal deficit that had ballooned to nearly $220 billion when Bush took office in 1989 with the heavy military spending and tax cuts of the Reagan administration. Bush ate his words in November 1990 and signed a budget deal in which he caved to Democrats’ demands for higher taxes on rich people, a move that hurt his standing among Republicans and led to his defeat in the 1992 presidential election to then-Arkansas Governor Bill Clinton. Despite the budgetary battles, Bush scored some major diplomatic and military victories as president. University of Houston political science professor Brandon Rottinghaus said Bush’s likeable personality and long career in politics prior to becoming president paid dividends when he entered the Oval Office. “President Bush connected with people well one-on-one and used this to win over critics and turn them into allies. Multiply these interactions by the dozens of years of service and President Bush collected thousands of friends and allies, forging an impressive network of supporters,” Rottinghaus said. He was credited with helping end the Cold War with the Soviet Union, which disbanded in 1991, and his approval ratings spiked to 89 percent after he got Congress’s approval for the U.S. military to enter Kuwait in 1991 to beat back an invasion by Iraq. The United States joined a coalition of longtime allies France, the United Kingdom and Saudi Arabia, to expel Iraqi forces from Kuwait. Rottinghaus said the victory was a defining moment for Bush’s presidential legacy, but that his most enduring accomplishment was strengthening environmental protections in the United States. Bush signed amendments to the Clean Air Act in 1990 that increased the government’s authority to crack down on toxic air pollution, and mandated cleaner gasoline for vehicles. He also helped negotiate the North American Free Trade Agreement between the U.S., Mexico and Canada. Bush and his late wife Barbara retired to Houston after his 1992 defeat, summering at their compound in Kennebunkport, Maine, and nurturing their son George W. Bush’s political ambitions. The couple had been married for 73 years when Barbara died in April. George W. was Texas’ governor from 1995 to 2000 before he won the 2000 U.S. presidential election, a position he held until 2008 when term limits forced him out. Bush’s other son, John Ellis “Jeb” Bush Sr., was Florida’s governor from 1988 to 2002. Jeb’s son, George P. Bush, was elected Texas land commissioner in 2014. He was re-elected in November. Over the years, George H.W. Bush received numerous honors. His name is known even to millennials, who know little about his legacy, in his adopted hometown. The Houston Intercontinental Airport was renamed George Bush Intercontinental Airport in 1997, the same year the 7,800-acre Cullen-Barker Park got its new name, George Bush Park. Bush’s legacy for Kennebunkport locals is much more intimate. Patrick Briggs is on the board of selectmen of Kennebunkport. Such boards are the equivalent of city councils for small New England towns. He is one of 3,600 people who live there year-round. Any summer day, Briggs said, there are 20,000 people in the town. The additions are tourists and part-time residents living in their vacation homes. Many of the tourists come to see Walker’s Point, a property that belonged to Bush’s mother’s family, where he proposed to Barbara in his 20s, on which his children also have homes. Briggs said over the years, he delighted in seeing the American flag, along with the Texas and Maine state flags, raised on a flagpole at Walker’s Point, because he knew the Bushes had made it to their summer home. “There was no announcement, they didn’t tell anybody. All of a sudden one day in early May annually they’d show up and you’d drive down the road and say, ‘Oh, President Bush is here. The flags are up,” Briggs said in a phone interview. The Bushes’ imprint on the town cannot be overestimated. Before they became too frail, George H.W. and Barbara attended the Memorial Day parade each year in the town’s main square. Barbara helped teach children how to read at the town’s library and walked her dog on its long beach. “If you were walking your dog, you could walk along with her and chat,” Briggs said. He said no one bothered the couple for autographs, but they welcomed anybody who wanted to take pictures with them. “They were so open. You could talk to them anywhere in town and people absolutely respected them and loved them for that,” Briggs said. Briggs said Bush was an exemplary president. “I think he gave us a model of a prudent, thoughtful, courteous leader for this country, and it just reflected his value system. He did not publicly demean people. He wasn’t about himself. It was just ‘How can we do better? Let me suggest these ways.’ He was a leader and it was the way he led,” he said.